What sort of finish do you like on your jewelry? And once you have chosen it, do you know how to take care of it? Whether we are talking about a historical piece, or a modern piece, the way that you prefer jewelry to look is very much a personal choice. It is important to realize that some pieces of jewelry, or other metal accessories like crowns, coronets, and buckles, are designed to be maintained in very specific ways. 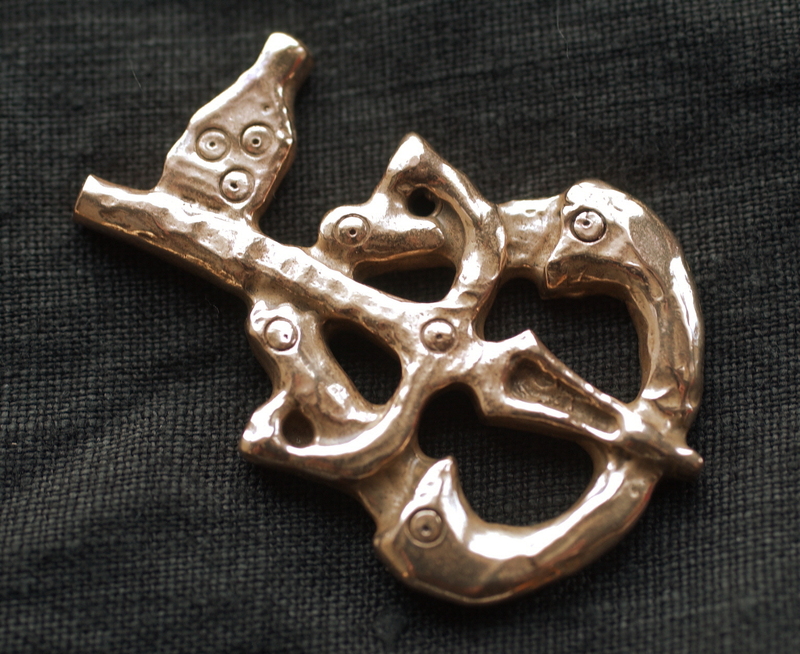 For example, the Viking Keys that I offer are sold with a bright finish. But bronze can attain a patina over time that you may prefer. The nice thing is that if you decide that a brown or blur-green patina is not to your liking, you can always polish it to like-new condition. When you buy a piece, ask the person who sells it to you what is the best way to take care of it. Generally they will know. I say generally because I have heard some very bad advice given at shows before, so I always try to make sure that my customers know what to do with my pieces. And I have helped other people’s customers on several occasions. If the advice that you receive doesn’t sound right, it is up to you to figure out what the correct process is. Most jewelers are happy to provide an explanation of why they recommend specific cleaning and care. I highly recommend that people understand what they are willing to do before they buy a piece. Someone who purchases a piece with bright, smooth surfaces, but refuses to polish the piece regularly, may not be happy with the way that their piece looks, unless they pay to have it cleaned professionally. For some pieces that are not damaged by liquids, buying something like a small home ultrasonic cleaner may be just the trick. Just follow the instructions and your piece will be as good as new. The easiest, and probably the safest, solution for dirty or tarnished jewelry, is a Sunshine Cloth. They are a chemically impregnated cloth, manufactured in Japan, that is safe for all metals. The cloth is non-abrasive, so it will not damage plated metals or leave scratches. I sell them in my store, and include them whenever anyone purchases a coronet. You can use the Sunshine Cloth to remove all of the tarnish on a smooth piece, or just polish portions of the piece to produce highlights. Gentle, but firm pressure is all that it takes to clean an amazing amount of build-up and tarnish from your pieces. Be sure to store it in a little ziplock to keep it fresh, and NEVER wash it – washing removes the chemicals that do the cleaning. The cloth will eventually become amazingly dirty, but it will continue cleaning even when it’s all black! If your piece is really dirty, you might try something like Flitz. This is a liquid cleaning compound generally found in motorcycle shops and automotive parts stores. When we received the Baronial Coronets that we planned to use during our tenure as Baron and Baroness, they were just plain grubby. They were tarnished and also had a layer of general grime. A good scrubbing with Flitz, following the instructions of course, and the coronets were clean and shiny. Both Flitz and Sunshine Cloths will leave an invisible coating to help protect the metal. We wore our coronets a LOT. I would clean them up a tiny bit before every use with a Sunshine cloth, and about every eight months I would do a “deep cleaning” with Flitz. And beware of lotions and perfumes! The chemicals in these concoctions can stain or tarnish your pieces. Lastly, if you prefer the shine and patina of a new item, ask your jeweler if they offer a clear transparent coating option to help keep your item looking like the day that you bought it. There are a number of coatings that can be used to retard tarnishing, ranging from polyurethane to clear nanoceramic plating. All of these coatings will eventually wear off depending on how you use the piece. Some, like the nanoceramic coating, have been reported to last a year or more in daily use. Metal objects can be a “living” thing – the care and feeding is up to you. This entry was posted in Jewelry and tagged cleaning jewelry, keeping jewelry clean by Eirny. Bookmark the permalink.